The Marine Mammal Center : This Sea Lion is Swell! This Sea Lion is Swell! 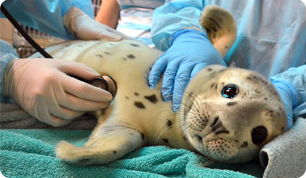 This young sea lion was treated for lung mites and leptospirosis. Swell is a young, female California sea lion, that was rescued at Crissy Field near the south tower of the Golden Gate Bridge on July 21, 2011. Concerned surfers spotted the yearling rolling in the surf and languishing on the sand. Named in honor of her surfer-rescuers, Swell was very small for her age. She was emaciated and suffering from malnutrition and very lethargic. After her admit exam, and a series of blood and urine panels, it was discovered that Swell was in bad shape due to leptospirosis, a common and potentially devastating bacterial infection that attacks the functionality of the kidneys. Radiographs revealed some mineralization in Swell's lungs pointing indicative of lung mites. Since Swell wouldn't take to the usual defrosted, whole herring, or squid that patients eat regularly, Swell was offered some live fish to stimulate her feeding instinct and boost her appetite. That seemed to do the trick and as of September 13, she has begun to eat whole herring on her own! She's also responding positively to antibioitc treatments. Swell is responding nicely to his antibiotic treatment for lung mites. Lung mites? Yes, these nasty parasites were discovered after a procedure involving radiographs and a subsequent bronchial camera-scope which showed the little critters responsible for Swell's raspy lungs, pneumonia-like symptoms and depressed behavior. Today, Swell also continues to improve from his concurrent case of leptospirosis, and is responding to his plan of antibiotics and fluids, now mostly received through his fish rations. Swell's menu includes live fish, to stimulate his feeding response, and defrosted squid and herring. Swell is eating up to 1.25 kilograms, (nearly 4 lb) of herring, per feeding!